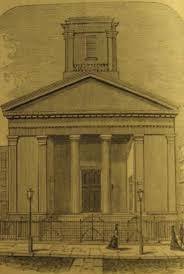 The Spring Street Presbyterian Church was built in 1810 on the corner of Spring Street and Varick Street in New York City. As the congregation grew, so did the city around the church. Spring Street Presbyterian Church is most notable for its involvement with the early 19th century abolition movement and its role in the Riots of 1834. The church was closed in 1963, and a parking lot was built on the site in 1966. In December 2006 construction crews working on the former site of the church uncovered human skeletal remains. Archaeology crews with AKRF and URS excavated the burial vaults of the Spring Street Presbyterian Church during the winter of 2006-2007. After the initial excavations and analysis, the collection of human skeletal remains and artifacts were sent to the bioarchaeology laboratory at Syracuse University in Syracuse, New York, for further analysis. This project has been ongoing since 2007. In summer 2014 the skeletal remains of the almost 200 individuals interred in the Spring Street vaults were reburied at Green-Wood Cemetery in Brooklyn. A year later, a headstone was placed to memorialize the congregation and those individuals who were reburied. On October 19th, 2014, a memorial service was held at the First Presbyterian Church in New York City to honor those buried at Spring Street Presbyterian Church. Please visit the Media and Memorial Service sections of this site to see video and images of this event, and to read about the performances and sermons. This site will continue to be updated as this project continues. Be sure to follow our blog and our Facebook page for updates.